Ok ladies and gents, I'm warning you in advance that this salad is NOT low maintenance. You have to roast things, use aluminum foil, dirty several bowls, etc. But it's worth it. It is a lovely diversion from a typical salad. 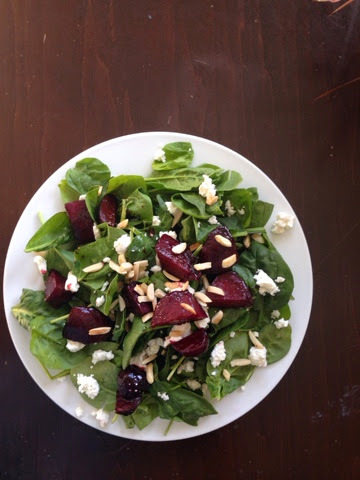 You get a nice earthiness from the beets, creaminess from the goat cheese, and crunch from the almonds. Definitely a good "I'm bored from the norm" salad. Get about 2-3 beets per person you are going to serve. You want the beets to all be relatively the same size. I had a few large ones but mostly small ones, so I cut the large ones to match the size of the small ones so they all roasted evenly. Trim the tops and feet off of your beets and peel them The outsides of beets are particularly dirty tasting, so peeling them helps cure that. Then wrap each individually in tin foil. Line a baking sheet with tin foil and heat your oven to 400 degrees. Put your beets on the baking sheet and bake for 1 hour. Then make your dressing. 1/2 cup olive oil, 1/2 cup balsamic, 2 tsp yellow mustard, salt and pepper to taste. Whisk together. When beets are done (fork tender in center) unwrap them and cut into bite sized wedges. Cover beets with 1/3 of the dressing so they are well coated and can soak it up. Plate each plate with a bunch of spinach. 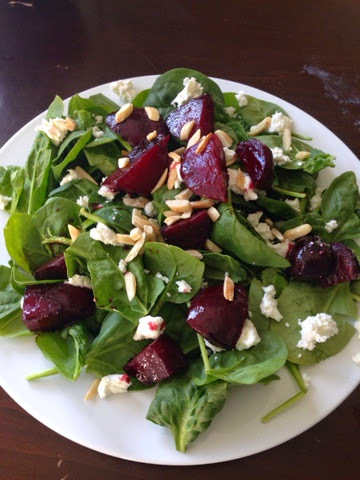 Then crumble goat cheese on top, sprinkle with toasted almonds, add the beets, then add extra dressing on top.